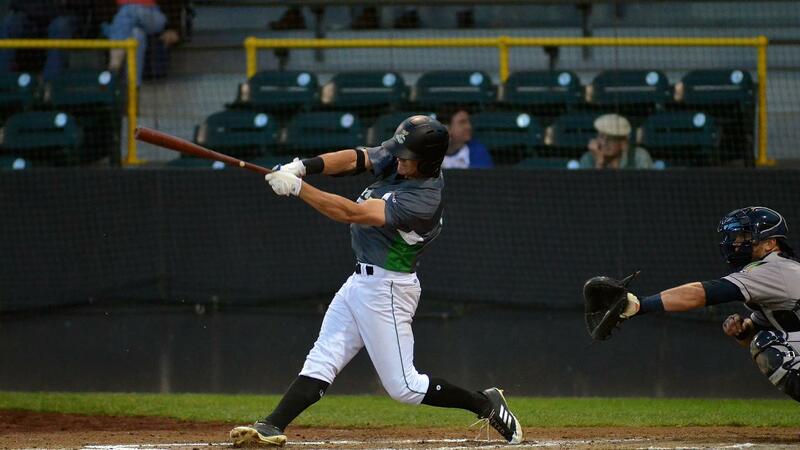 Jack Larsen homered in his return to the LumberKings lineup on Friday night at Neuroscience Group Field. Grand Chute, WI (June 29, 2018) - Jack Larsen homered in his first at-bat back from the disabled list in the Clinton LumberKings 9-7, 10 inning, win over the Wisconsin Timber Rattlers on Friday night at Neuroscience Group Field. LumberKings (6-3, 45-34) batters tallied 15 hits against five different Timber Rattlers (3-6, 34-44) pitchers to earn the win. The LumberKings faced Major Leaguer Zach Davies, who was making a rehab start, and pounded the righty for six runs on 10 hits over his three innings of work. In the top of the first, Eugene Helder doubled with one out and scored the game's first run on a Ryan Costello triple to right center field. Larsen then capped the rally with a home run to right for his eighth homer of the year. Clinton starter Scott Boches allowed the Timber Rattlers to creep back to within one in the bottom of the second inning. A one out double by Tristen Lutz was followed by a two-run home run by KJ Harrison, his seventh of the season. The LumberKings second three-run rally of the night gave them their largest lead of the night. Once again, Helder began the rally, singling to open the frame and was chased home on a Costello double. Larsen added a double following Costello being thrown out at third and Keegan McGovern launched his third home run of the season to the opposite field in left to put Clinton on top 6-2. Wisconsin roared back with five runs in the bottom of the fourth inning to take a 7-6 lead. 10 Timber Rattlers batters came up in the inning to put up their five runs on five hits against LumberKings reliever Tyler Jackson. In the top of the fifth, the LumberKings tied the score at seven when Larsen scored from third with two out on a Carlos Herrera wild pitch. The game remained tied through nine innings until the LumberKings came up with two runs in the top of the 10th. Larsen was the free base runner assigned to second, as per Minor League extra inning rules, and moved to third on bloop single to right by Johnny Adams. Larsen scored on a sacrifice fly by Zach Scott off Timber Rattlers reliever Cody Beckman and Dimas Ojeda scored Adams with a double to the gap in left center field. Beckman (1-3) took the loss for Wisconsin for a two-inning outing in which he allowed two runs, one earned, on two hits while walking none and striking out one. Collin Kober earned the win for the LumberKings. He recorded the final six outs for Clinton not allowing a man to reach over his two innings of work. Kober (4-0) struck out two during his time out and retired Tristen Lutz on a pop up in foul ground to end the game and earn his fourth win of the season. The LumberKings will meet the Wisconsin Timber Rattlers for the third game of their four-game series on Saturday night. Clinton will give the ball to left-handed pitcher Oliver Jaskie (3-7, 6.23) while the Timber Rattlers will go with righty Bowden Francis (4-4, 4.41). First pitch is scheduled for 6:35 PM. Fans looking to listen to the call can hear Erik Oas at 6:20 PM with the pregame show on 100.3 FM WCCI.